ARIS, 14 July 1997 - In Africa, just as elsewhere, and perhaps more so there, magic and sorcery are not to be confused. While sorcery, which is widespread but unanimously execrated, serves the forces of evil, magic in all its forms and through its widely differing practices tends to intercede for the good of peoples and nations. The force by which the supernatural powers can be summoned is housed most frequently in a statue or statuette, which can be anthropomorphic or zoomorphic in style and which is only effective if particular offerings and rituals have been accomplished and renewed. When the Portugese landed in the Gulf of Guinea in the XVth century they named these objects "feitissos": manufactured objects or artifices from which is derived the word "fetish". But in view of the disparaging connotations and misunderstandings which have built up around this word over time, nowadays we prefer the term "power objects". Admired and collected, they fell into more or less enlightened hands and for a long time they were stripped of all that was seen as trimmings: cloth, fibre, pouches, feathers, string and organic or earthen coatings, to retain only "pure" forms aesthetically more accessible to the European eye. On view until 29 September, the Musée Dapper presents ninety sacred objects of which many are in their original state. The majority of objects exhibited stem from four geographical zones: Congo-Zaïre (Teke, Kongo, Songhye and Yaka tribes); Benin (Fon kingdom); Mali (Bambara tribe) and Ivory Coast (Senufa and Baule tribes). The nkisi statuettes come from the Congo and Zaïre. Made and endowed with their powers by the medicine man or "nganga" as he is known in Bantu languages, they most often comprise one or more cavities, usually located around the abdomen, which have been filled with different sacrificial materials: clay, blood, plants, which are placed in a cloth pouch or a reliquary mounted with a mirror. This bilongo is placed on the statuette at precise moments only during the lunar cycle and, if its powers are shown to work, it can be used separately or even sold. If the object has been made for use by the community, it is called a nkonde and can be used to ward off sorcery and social strife as well as to regulate pacts and alliances. Its powers are renewed each time by planting a blade or a nail in the statue's body. The ngangas who make the nkisis and nkondes are alone capable of bestowing them with these powers and are usually richly paid for these objects which are indispensible to the good workings of society. An important part of the exhibition is given over to objects from the Kingdom of Fon in Dahomey (nowadays Benin), brought back to France by a colonial expedition under the name of "Treasure of Behanzin". The reign of King Glele (1858-1889) corresponds to the apogy of the Fon kingdom. Following in the footsteps of his father, King Guezo (1818-1858), this monarch contributed to the freeing of his country from allegiance to the Yoruba. Feared and respected, his name was known as far away as Europe and Brazil. Like his forebears, he was chosen among the many sons of the previous king by an oracle, the "Fa". The oracle in its poetic and cryptic utterances also revealed his destiny to him, the things which would be forbidden to him and the symbols which would mark his reign. The king ordered from his blacksmiths and goldsmiths a series of statues to commemorate and renew the promises of the oracle: this is the case with the silver lion, emblem of power, or with the striking brass representation of Glele holding two sabres. Among the peoples of Africa, the Bamabaras from Mali have one of the richest mythologies enshrined in the representation of the gods of their ancient cult called Do: the primordial twins, Ba Faro, goddess of water, and Bemba, the cavalier god, as well as a young girl whose image bears the name of Do Nyeleni ; "chosen one of the Do". She is central in Do ceremonies to foster fertility among young womenfolk and safety in first childbirths. "Do Nyeleni" statuettes with their accentuated feminine forms, daring stylisation and the geometric motifs used to decorate them, are among the most beautiful of African artworks, and are represented here by three of the most striking examples. Other power objects (bolis in Bambaran) are particularly interesting, the hunting "bolis" representing the great Segu god, Makungoba, in the form of a headless buffalo. The addition of organic matter, notably sacrificial blood, to a structure of wood and clay, gives them a massive and powerful aspect bordering on the abstract. Present, too, in this exhibition are examples of Baule and Senufo statuary from the Ivory Coast. Renowned for the quality of their masks, they offer widely contrasting power objects, ranging from the willfully ugly face of the "kafigeledio", a shapeless spectre clad in coarse blood-stained cloth,to feminine sculptures with their slender forms and exquisite patina, or to delicately worked musical hammers. In each and every case, what is important is the supernatural power they bear and which is expressed by their repulsive, or on the contrary attractive, aspect depending on the purpose of their magical function. As with all Musée Dapper exhibitions, particular attention has been paid to the lighting of objects and readability of explanatory texts. 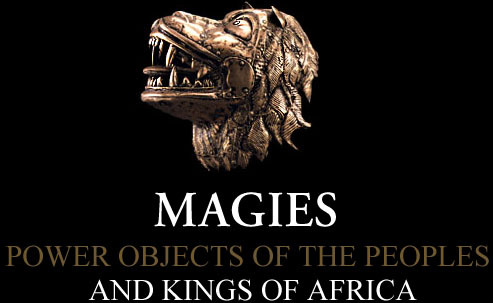 Commentary is, as always, laconic; no logorrhea, but short, precise statements which are an incentive to buy the well researched and fully documented and illustrated catalogue, "Magies". Open daily (including Sundays and holidays) from 11 a.m. to 7 p.m. The photographs in this review, taken from the exhibition catalogue, are published by kind permission of the Musée Dapper, Paris. Copyright © Musée Dapper.